Marinade the pork chops in with salt, sugar, pepper, wine and garlic for 30 minutes. Dip the pork chops one piece at a time in flour, then in the egg and finally in the bread crumbs. Deep fry the pork chops in medium high heat till slightly golden brown.and set aside. Chop into slices when cool enough to handle. 3. Dice the onions and tomatoes and heat them slightly. Add tomato ketchup, salt, pepper, Worcestershire sauce. Reduce heat and let braise for 15 minutes. Add cornstarch and water. 4. Heat oil in wok then add the eggs, cooked rice and stir fry (add salt to taste and pepper to taste). 5. Put the fried rice on a large oven dish. 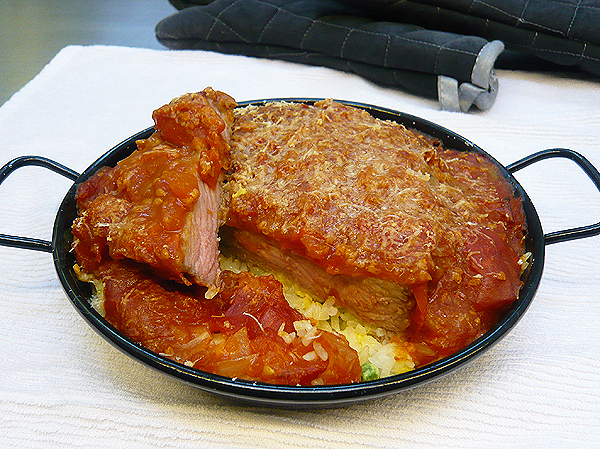 Place the fried pork chop on top of the rice in a single layer. Pour the sauce evenly over the pork chop. Bake in the over for 5 minutes or till the sauce is slightly brown on top.